For you Gen Xers or Yers, this is not a recipe about a rat, who directs a clueless chef in a French restaurant. Actually, I didn’t even see that movie, but I’ve seen trailers. 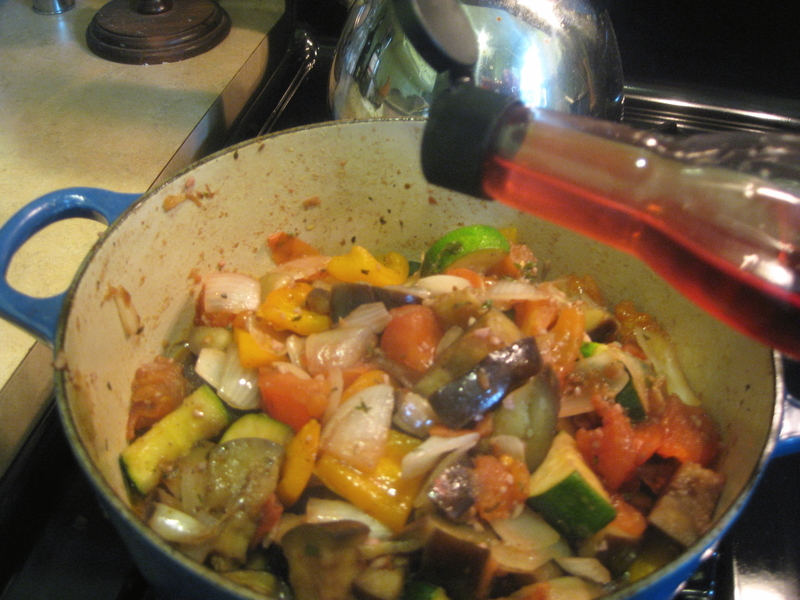 Ratatouille is a veggie melange or medley that makes a great side for almost any main dish. It also keeps well in the fridge to microwave for lunch or a snack. I like it because it’s tasty and fun to make. This approach comes from “Ten Dollar Dinners” cook Melissa D’Arabian, who married a Frenchman and advises it’s made in a special order required by her mother-in-law: Remember EZPOT. 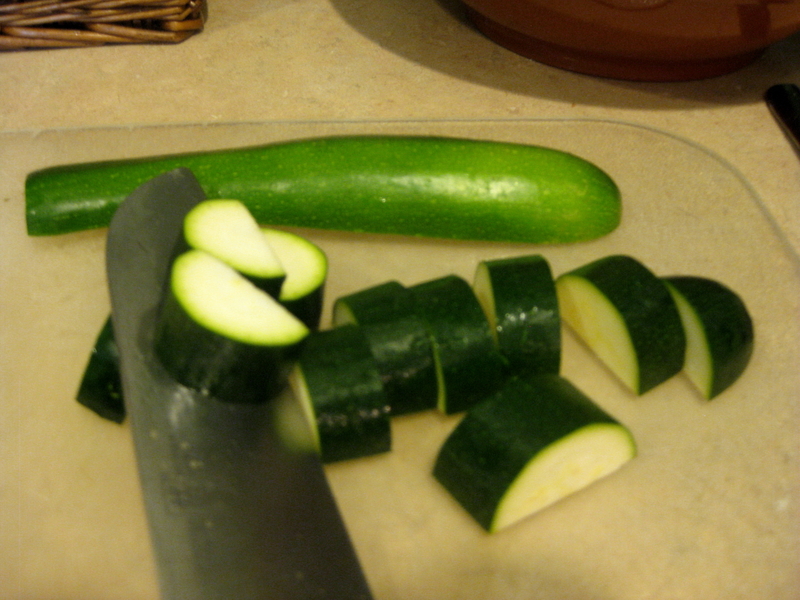 Wash veggies, begin to prep each in bite-size pieces. Try to keep them close to the same size for uniform cooking. 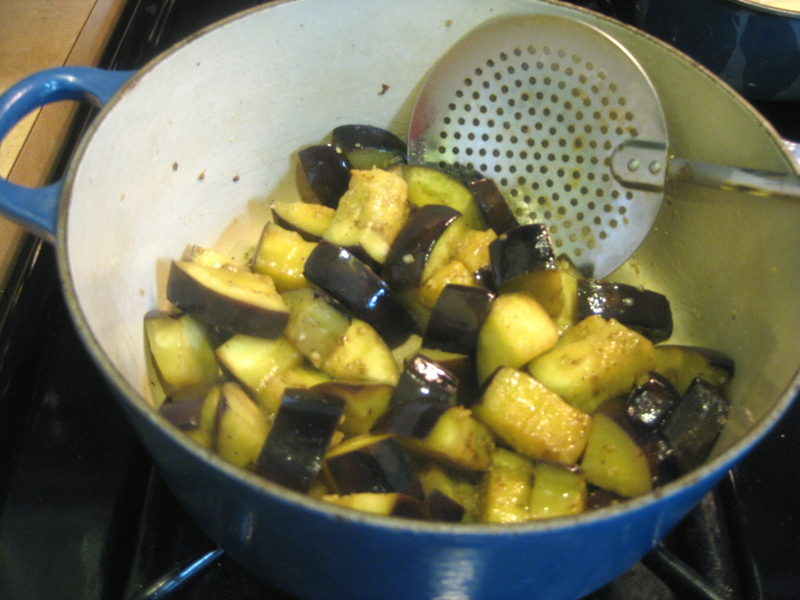 Drizzle olive oil to cover the bottom of your dutch oven, medium heat. 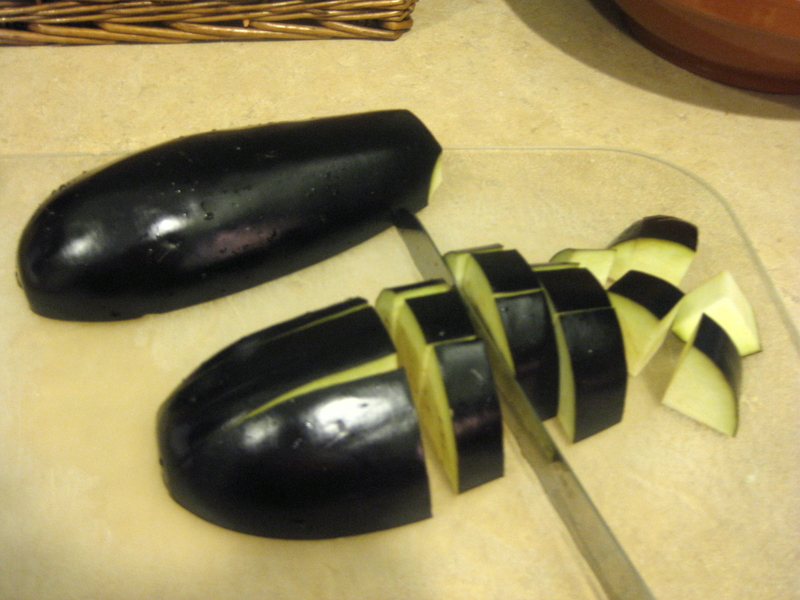 Add eggplant pieces, little salt/pepper. Stir occasionally. Brown 5 minutes. Remove to large bowl. Same for zucchini, then peppers, then onions. 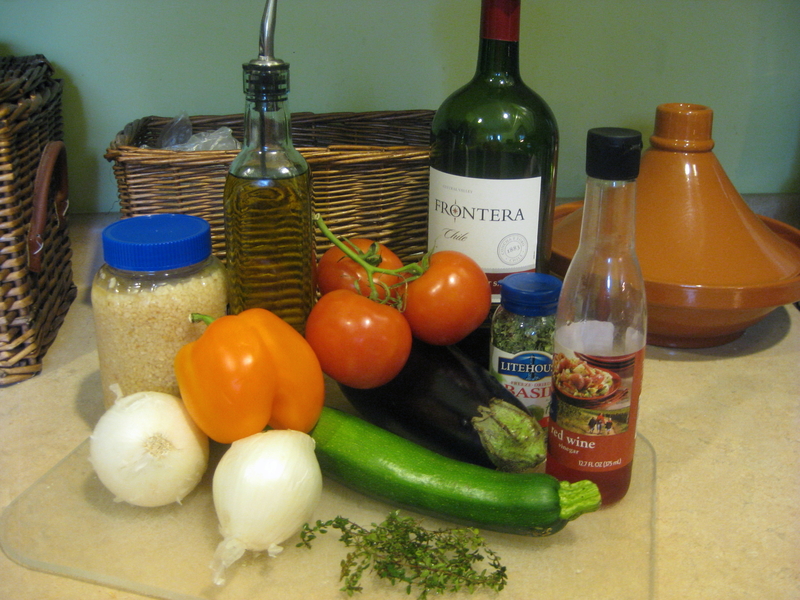 Add more olive oil, if you need it. Careful, you may want to lower your heat a little because a dutch oven can get very hot, even on medium heat. 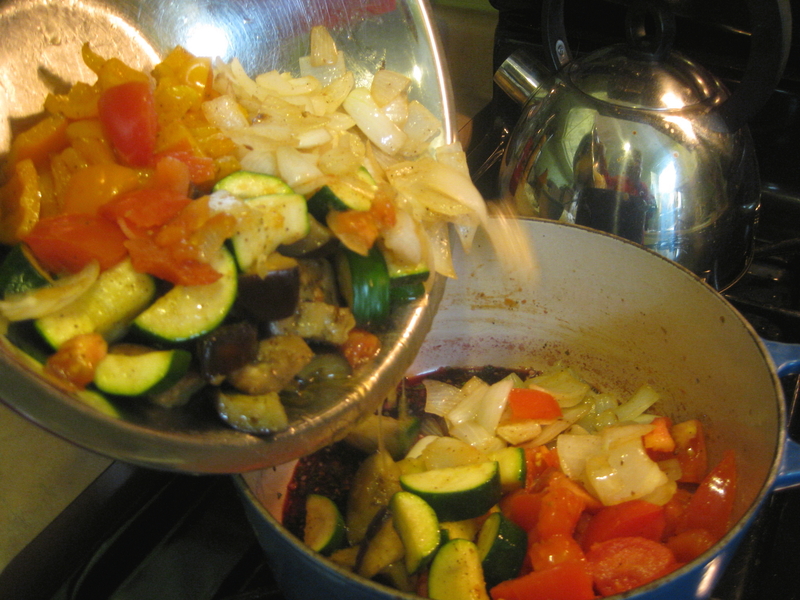 EZPOT – eggplant, zucchini, peppers, onions and tomatoes. 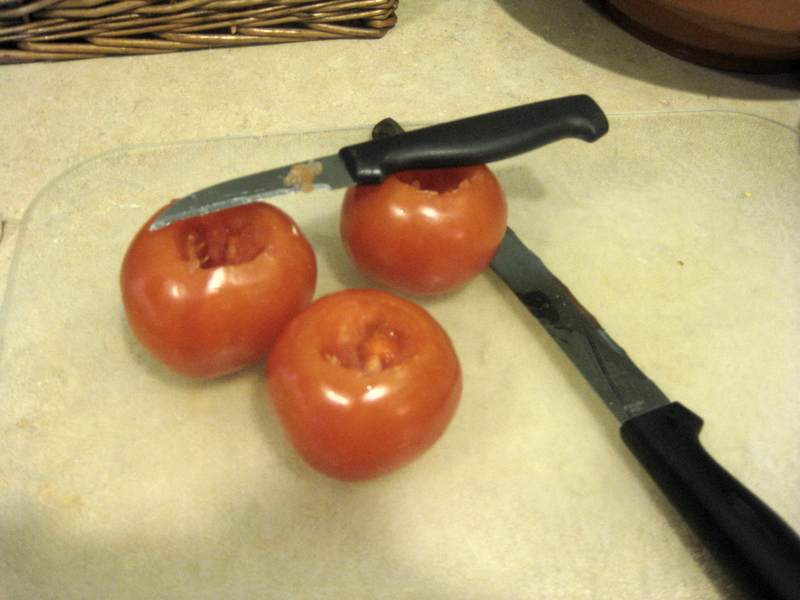 Now, it’s time for the tomatoes. They’re likely to sizzle a bit and help de-glaze pan, if the onions haven’t already. Cook 4 minutes. Remove to the bowl with the other veggies. 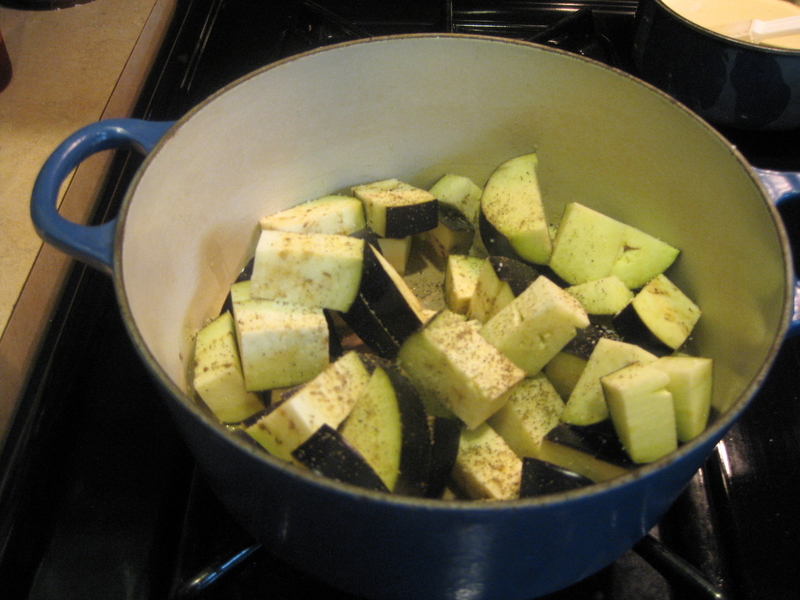 In your empty pan, add garlic, herbs and wine. 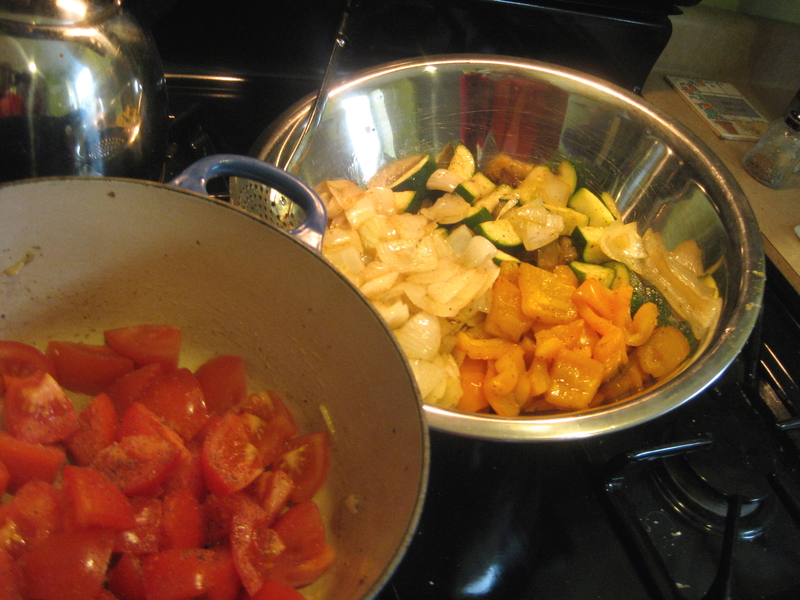 After 2-3 minutes, return all veggies to the pot. Be careful not to cook too much – mooshy veggies aren’t good. Heat about 5 minutes until everything’s re-heated and coated with the herb-wine. Remove from the heat. 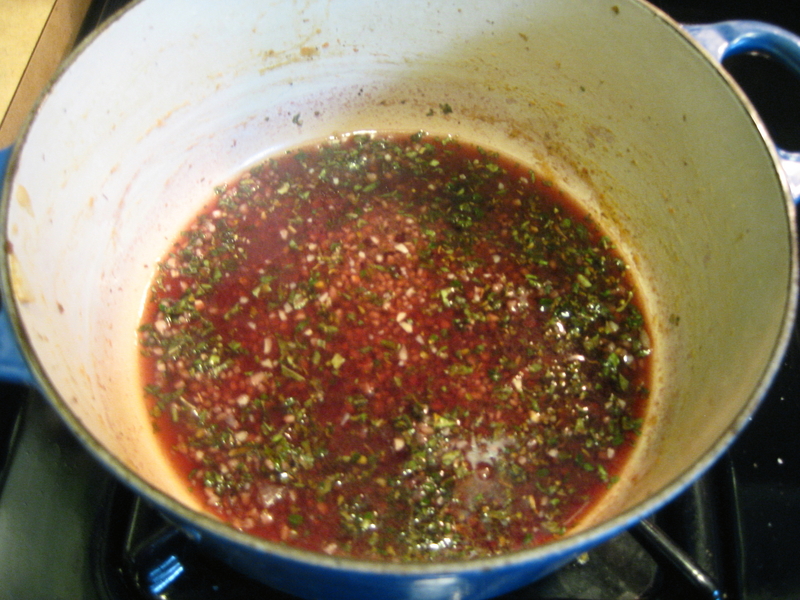 Add several sprinkles of red wine vinegar. Stir gently. 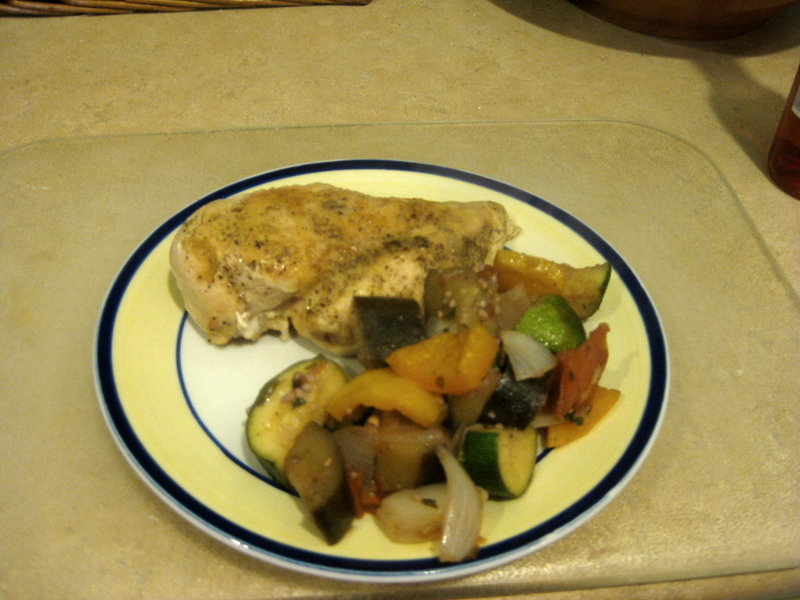 Check for seasoning, add salt/pepper if needed. SERVES 6. 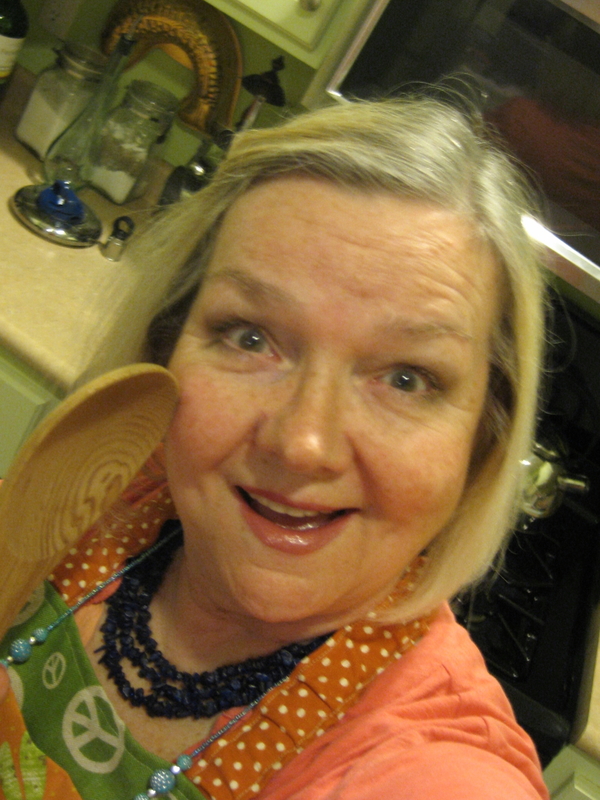 SERVE: As a delicious side dish with almost any entree.